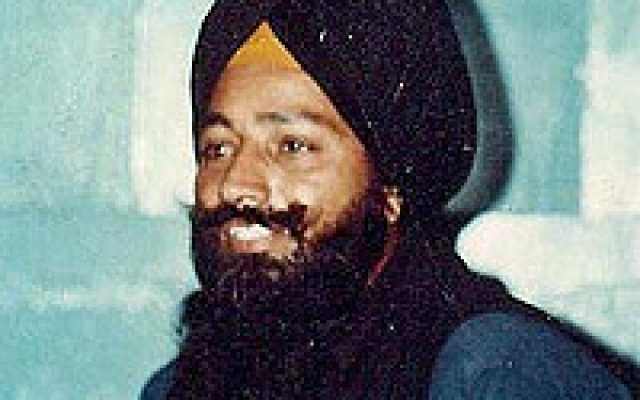 Bhai Fauja Singh was born on 17th May 1936 in District Gurdaspur. His father Sardar Surain Singh was a middle class farmer. After the formation of Pakistan they moved to the village of Gazneepur, which is 6 miles on the Gurdaspur Dera Baba Nanak road. During his childhood days Fauja Singh always used to be the leader of boys of a similar age in his village. He got baptised while he was studying in the tenth class, but because he did not receive the gift of Naam, the spiritual hunger inside him did not disappear and his mind was always elsewhere. At this small age he disappeared from home for one month and stayed with some Sants and Sadhs. After passing the tenth class he enrolled in Khalsa College, Amritsar, but still his mind was elsewhere. He then again disappeared. His family looked for him everywhere and even advertised in the papers. He stayed away from home for 2 years at the Deras of the Sants and Sadhs to try to satisfy his spiritual hunger. A false Sadh gave him a Mantar on which he meditated for 2 years. Then he was found and brought home and his family again put him into College. In 1964, he got baptised at a smagam organised by the Akhand Kirtani Jatha. On Vaisakhi 1965 his marriage took place with Bibi Amarjit Kaur and on this occasion Bhai Jeevan Singh performed the Kirtan. At the age of 28 Bhai Fauja Singh again took up the appearance that was most loved by the Tenth Guru. Whoever the Guru blesses, he shows that person how to wear the uniform of Akal Purakh`s Khalsa army. After 1970 Bhai Fauja Singh started doing a lot of Seva for Gursikhs. He worked around Amritsar. He used to spend all the wages he and his wife earned on the Seva of the Singhs. Bibi Ji told us that sometimes he used to say “All the money we spend on ourselves is wasted but the money we spend on doing Seva for the Gursikhs is not wasted and is saved in our bank”. Then he would say “The tenth Guru formed the Khalsa by shedding his blood. When this plant gets dried up, it needs more blood. Then the Guru`s beloved ones spill their blood to keep the Khalsa`s flag flying. This cycle comes approximately every 50 years”. On the day of Vaisakhi 13th April 1978 about 125 Singhs went to peacefully protest against the Nirankari procession and against Nakali Nirankari Gurbachan Singh’s insults against the Gurus. Bhai Fauja Singh was barefooted and all the Singhs were reciting Gurbani. The Nakali Nirankari army fired at the unarmed Singhs, and Bhai Fauja Singh and 12 other Singhs became Shaheeds and 70-75 Singhs were wounded. After his Shaheedi, the Leaders and Jathedars of the Panth stated that Bhai Fauja Singh and the other Singhs had given “Shaheedi” for the great task from which we had been hiding. They had not only woken the Panth, but also made us stronger, so that we can pay more attention to this in the future.